A few days back, I went to The Akshardham Temple, Jaipur with my mother and her sister. I had recommended this place to them. The architecture here, is quite intriguing and the place also has a well-maintained garden right opposite the temple stairs. We arrived a little early, at about 5.40 pm. I inquired with the gatekeeper about what time does the Main Aarti ( prayer) takes place everyday. He told us that there are Two Aarti's (prayers), one at 7 pm and the other one at 8 pm. We had plenty of time, so we decided to take a walk in the garden and took some casual cellphone pictures. It was still only 6.15 pm and we had plenty of time left for the Main Prayer to begin. There is a small eating place inside the vicinity, towards the right of the Temple. We decided to have our evening snacks there to kill some more time. I had been to this Temple before. So, I knew there was another place right below the Main Temple, where worship takes place. I told my mother while we were eating, that I shall quickly go and check, if that portion of the temple is still open like last time. While I was on my way, I spotted this water puddle, but to my disappointment I could not see a decent reflection in it. I proceeded to the place downstairs. On my way back, I again had a look at this water puddle from a distance. This time, I could see the reflection of a palm tree placed in the garden, in it. Right behind the Tree, there was this beautiful lamp that you see in the reflection. So, I became both curious and excited. I wanted to find out whether with my feet movement, I'd be able to get the reflection of that Garden Lamp in the water puddle. After a lot of adjustment and bending and trying to look with one eye closed, I finally found the reflection of the Garden Lamp being casted in the water puddle. I did not had the camera with me that point of time. It was on the table at which I was having my evening snack with my mother. Since light had started to fade fast, I knew I had little time to go back, bring the camera, punch in the settings and Click the photo. So, I rushed to get my camera back and finally took this shot. Initially, I tried using a faster shutter speed and a lower ISO, but that did not work well as the light was fading. The Photo falls under the Minimalism as Less Elements Category of "Minimalist Photography". 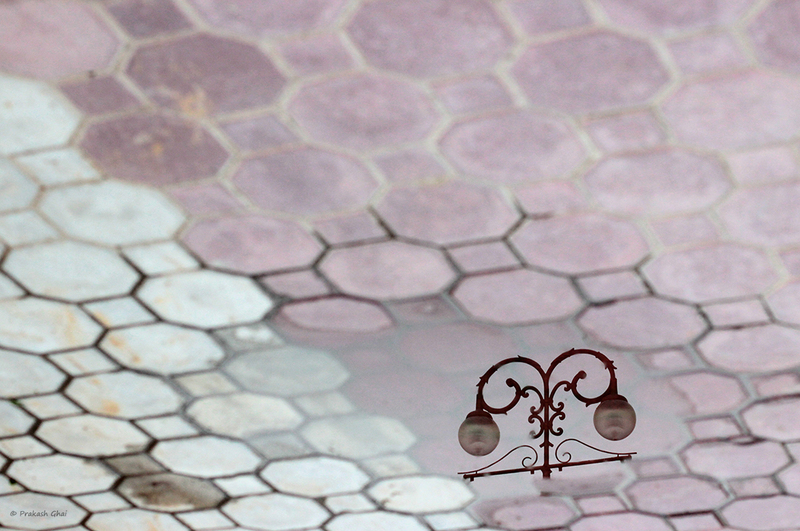 b) The Water Reflection Of Garden Lamps. Also, there is plenty of negative space in the frame which adds to the beauty. Please Note: I have flipped the photo upside-down to make it more appealing. Reflection Photos generally are taken straight first to adjust for rule of thirds and to balance the composition. Later, they are Flipped. It may sound a little tricky, but you will get it right with some practice. To get a clearer idea of what I mean, turn your cellphone upside down. If, you are viewing this picture via the computer, then right click, and "Save Photo" and then Flip it. OK, I am done for the day. As you can see above. 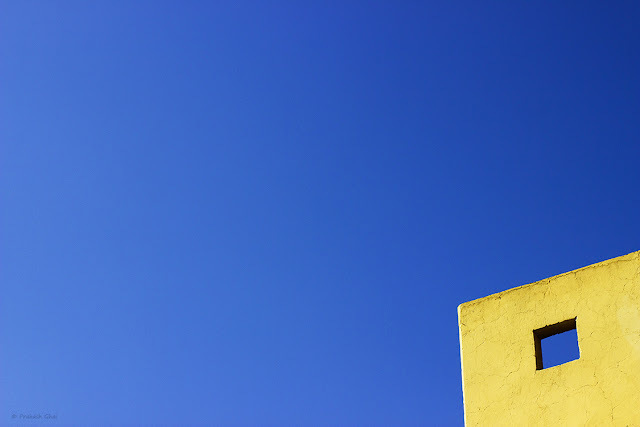 This Minimalist Photo is all about "The Blue Square". Squares are my favorite shape when it comes to Minimalism as Simple Geometry. Here, you can see a blue one. And I hope one day, I collect as many different colored Squares as I can. Ok, lets talk more about the composition. This photo was taken right outside the exit gate of Jantar Mantar Jaipur. As you can see, I have used a lot of negative space in the photograph. I filled that space with the blue sky, and placed my subject at the extreme bottom right. 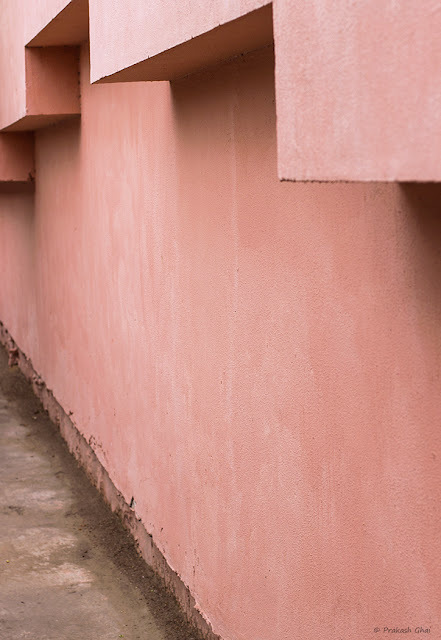 This, is a perfect example of both: Minimalism as Less Elements and Minimalism as Simple Geometry Photography. (Simple Geometry being "The Blue Square"). It is a matter of choice as to what you want to categorize this photo under. This is a Look-up Minimalist Photograph. By Look-up I mean, "Looking up in the sky, trying to find photographic subjects." This kind of Photography is really very interesting. You wont find out, until you try it for yourself. Trust me, the results are going to be really interesting. If you have had clicked such photographs before or if you are going to give such photography a try in future, make sure to leave a link to that photo below. It would be nice to have a look at your creativity. Don't worry about not having a zoom lens etc. I took this photograph from a Canon 50mm Prime Lens. You can even try using the wide angle Mobile Phone Camera Lens, to Explore your Creativity. Hope you enjoyed the post. Happy Clicking ! 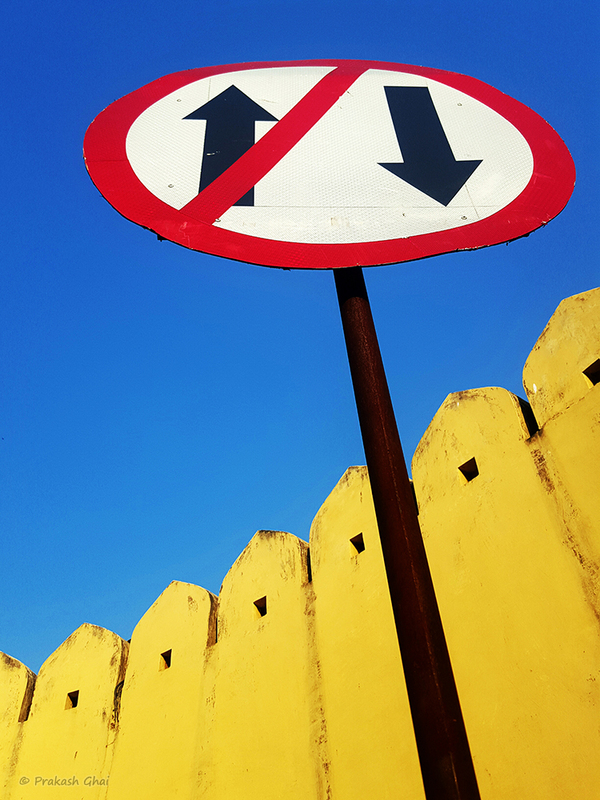 I spotted this One Way Traffic Sign right in front of Jantar Mantar (Jaipur) entrance gate. I parked my bike under the sign and this was the first shot of my Minimalist Photography photo-walk today. I mostly take photos from my standard Canon DSLR Kit, but this particular shot was taken by my Samsung Galaxy S6 SmartPhone Camera. The reason why I chose to take this picture via my cellphone and not via the DSLR was simple. I needed a wide angle lens to achieve the kind of composition I had planned in my mind. The subject was way too close and I had my Canon 50mm prime 1.4 lens on, on my DSLR. I do not own a wide angle lens. If I had one, I would have used that. As you can see, I am right under The One Way Traffic Sign. I was looking at it at an elevation of approximately 70 degrees. I bent down on my knees to begin with, but that wasn't sufficient. So I decided to sit on the road. Trust me, it was fun. More so, because the people around started to observe me. I am sure they were all wondering... What was so special about this Traffic Sign? that they had missed and I did not. Anyways, lets get back to the Minimalist Photograph. I took about three shots from my Cellphone and finally I was happy with one. Usually, I edit cellphone Minimalist shots with the Phone's default editing app. But, this photo, I transferred from my cellphone to my Laptop and then edited it. I did so to better enhance the contrast and the overall saturation. A hint of sharpness too, was added. The Classification: The photo falls under Minimalism as Less Elements category. Hope you enjoyed the Shot. Don't forget to follow Traffic Rules !